I've raved about the Wet 'n Wild highlighters on many an occasion. I think they're the cream of the crop as far as drugstore glow-givers go and I don't think they get as much credit as they ought to. In light of that, I thought I'd take the opportunity to wax lyrical about the ones I have in my collection today! They first introduced their Megaglo Highlighting Powders about a year or so ago with Precious Petals. Initially supposed to be a limited edition drop, people loved these powders so much that the disdain was palpable once they were sold out. Wet 'n Wild decided to bring them back and now they're part of the permanent collection - hooray! 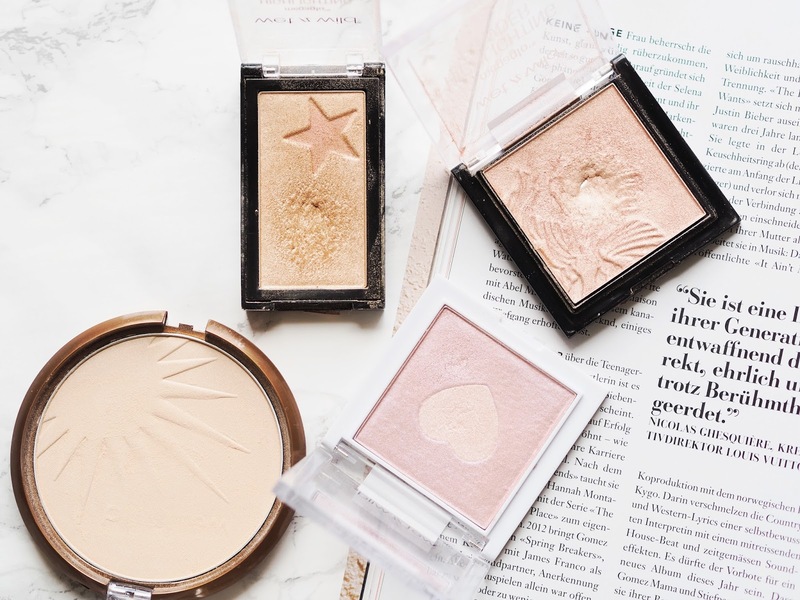 There's a reason why these did so well: you've got all the glow and pigmentation of a high-end highlighter with a drugstore price tag. Precious Petals is reminiscent of champagne pop, just slightly more peachy. It looks stunning on the cheeks and it's the first highlighter I've ever hit pan on! When the Megaglo Highlighting Gold Bar was released around Winter of last year, I jumped right on that and snapped it up as soon as I saw it in the "new in" section of the drugstore. This one is no longer available but it has the same fantastic formula, along with imparting a gorgeous golden sheen. One of their most recent highlighter releases is the Megaglo Highlighting Powder in The Sweetest Bling from their Queen of my Heart collection. If you like a pink-y highlight then this is one you should grab! The collection is limited edition but it's still online as well as in my local drugstores. Same fab formula, new rosy shade. Not only does the heart design in the powder look super cute, but the heart and the rest of the powder are two different shades. The centre is more of a peachy champagne, whilst the outside is definitely a rosy pink highlighter. Finally we have one that is slightly unexpected, given that it's called the Coloricon Bronzer. It's in the shade Reserve your Cabana and it's basically an ever so slightly sheeny, creamy coloured powder. If you're someone who really prefers more of a subtle glow as opposed to an in-your-face beam, this might just be up your street. It's practically undetectable if you don't know it's there but the healthy glow it imparts is absolutely lovely. I always have seen very good review about this highlighter. But couldn't try this as not available in U.K. Recently, I did Spring make up lesson , so I need to practice a lot to improve my skill. I am going to visit my sister U.S.A next month. I will must try this one.